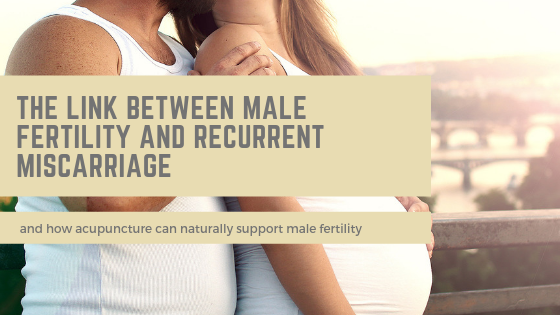 Acupuncture and antioxidant supplementation can be part of a plan to improve male fertility and reduce your chance of a miscarriage. A Recent study from the UK shed some additional light on an often overlooked cause of recurrent miscarriage. It was found that men in couples with recurrent miscarriage had much higher levels of molecules called “reactive oxygen species” (ROS) in their sperm. Produced naturally in the body, ROS can help protect sperm, but higher concentrations can damage sperm and affect fertility. High rates can increase rates of infertility can even affect embryo implantation after IVF. It can be a reason for poor IVF fertilization rates, unexplained infertility, failed IVF/ICSI cycles, and/or poor embryo quality. In couples with infertility, up to 80% of men tested showed increased concentrations of ROS. This is a big deal. How can you lower ROS levels? After understanding more about how levels of ROS can profoundly affect your fertility and be a cause of miscarriage, the next step is to come up with plan to lower it. Taking a look at the causes, there are probably some things you identify here to work on. Supplementation with an antioxidant has been shown to be helpful in reducing levels of ROS. At our clinic, we recommend Conception XR to our male patients. This supplement contains high doses of antioxidants like selenium, vitamin C, and vitamin E along with other nutrients shown to support male fertility. For men that also experience issues with sperm motility, they make a product with additional supplements specifically for motility. Anything done to improve your overall lifestyle will be helpful for improving ROS levels. Maintaining a healthy body weight through diet and exercise is top on the list. Also, if you are a smoker, developing a plan to quit (acupuncture can help with this too!) and reducing the amount of alcohol consumed. Avoid exposure to toxins at work and at home If you work in an environment where this exposure is common, consult your supervisor to make sure you are taking the proper precautionary means to prevent or reduce exposure. Since high levels of ROS can be caused by many common conditions, a visit with your doctor to rule some of these things out is a good idea. In many communities, there are urologists who specialize in male fertility. Here in Knoxville, we recommend Dr. Kim at UT Medical Center for our male patients wanting to discuss their options. More and more research is pointing towards the importance of healthy sperm. Their role in creating healthy embryos and babies cannot be overlooked in the diagnosis and treatment of infertility. We encourage everyone to discuss this with your doctor and see if any additional testing is appropriate. In the meantime, working towards a healthy lifestyle and changing some of your bad habits can have a big impact on your fertility. If you have more questions about acupuncture can help support male fertility. Please reach out via email or phone (865)-315-3845. We are always happy to help! If you’re ready to begin your integrative fertility journey and add acupuncture to your treatment plan, we have online scheduling available at our website.